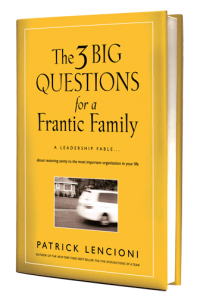 In my last post, I told you about Patrick Lencioni’s new book, The Three Big Questions for a Frantic Family: A Leadership Fable About Restoring Sanity to the Most Important Organization in Your Life. In it, Lencioni shows families how to live with more purpose, clarity and meaning. Of course, we’re all about that here at Life Compass too! The Mrs. and I, with five kids, have definitely needed to strategically think through some things regarding our family life. Every family is different, and every family needs to understand how it differs from the one next door. Otherwise, we become generic and feel unnecessary pressure to be like the Jones’. He explains that there are two basic ways that families differ: their values and strategies. These can be clarified by figuring out what two or three qualities are at the family’s core and what life experiences make it different. A second part of uniqueness has to do with your family’s strategy. He describes this as the big choices you’ve made in how you live your life. For instance, does one of the parents stay home to be with the kids full-time? Do you live near relatives? Do you live below or near your means? Are you fiscally conservative? Do you have lots of family friends or just a few? Ask yourselves which of the answers to these questions, and others differentiate you meaningfully from most other families. Once you’ve determined your values and strategy, you’ve established a context for making big decisions that should guide your life. When your neighbor asks if you want to go in on the purchase of a condo at the lake, you can reflect on your values and strategy and easily determine if it makes sense. When the coach of the baseball team asks if Johnny wants to play on the traveling little league team, you can ask yourself whether or not this is compatible with your family values. And when your best friends invite you to spend the summer traveling in an R.V., you can decide if that it something that suits your family’s identity or not. Sure, you will still be required to make a judgment, but doing so will be relatively easy in the context of who you are. That’s it for Question #1 of The Three Big Questions for a Frantic Family: “What makes your family unique?”. In my next post I’ll cover Question #2: What is your family’s top priority rallying cry right now?